Slab Leak Costs vary depending on the repair options available. Your Dallas plumber will provide options to repair the leak. What is the cost to Repair a Dallas Slab Leak? The cause type of a Dallas slab leak will directly affect the cost. There will also be a cost to detect your Dallas, Texas slab leak. Your insurance company should be contacted, as they will many times pay for parts of the repair. 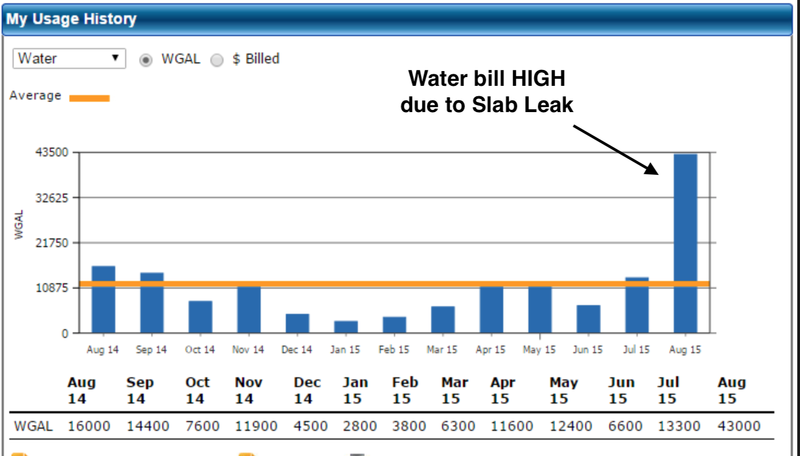 Slab Leak Detection cost for in Dallas? Highly skilled & Best plumbers and specialized leakage detecting equipment are required for finding the site of a Dallas slab leak. This can cost anywhere from $125-$800 and more. Some Dallas plumbing companies offer slab leak detection as part of their repair services, but many use contractors who specialize in slab leak detection. If you have a Dallas slab leak, definitely get a proven professional plumber to do the work for plumbing in concrete slab. This type of Dallas plumbing repair is NOT for a junior plumber. Slab Leak Repair Cost in Dallas? There no single answer for the cost of a Dallas slab leak repair. It will depend on the type of leak and the location of the leak. The type of leak can be a “One-Point” leak or a “System-Integrity ” leak. The location of your Dallas slab leak can be in the “Middle your Home” (bigger challenge) or at the ”Edge of the Slab” (a potentially lesser challenge). One-Point Leak – The One-Point leak repair process is to locate the leak, gain access to the leak, repair the leak, and finally replace the access point. This type of Dallas slab leak can be straight forward. However, the major cost variable is the location of the leak. System-Integrity Leak – The System-Integrity leak means that a section or the complete water structure has poor integrity and must be replaced. Poor integrity can come from corrosion, use of harsh “un-clogging” chemicals, or natural wear & tear. The Dallas plumber must determine how much of the water structure should be replaced or re-routed. Often it is less costly to re-route the water system. It is very important that an experienced Dallas plumber ensure that the One-Point leak is not a System-Integrity leak. If a System-Integrity slab leak is repaired as a One-Point slab leak, when the system is placed back under pressure, another leak will occur (maybe not immediately) as the integrity of the structure is faulty. Finally, it should be noted that System-Integrity can be difficult to determine based on the location. In simple Dallas slab leak situations, costs for re-routing a short length of pipe can start at $200-$600, but more often will run $1,000-$3,000, and can go as high as $5,000 or more. If the Dallas slab leak is just one symptom of a disintegrating plumbing system and it appears that leaks will continue to occur throughout the house, it might be time to replace all of the pipes, which could cost $2,000-$15,000 or more. Does Insurance cover Slab Leak Repair Costs in Dallas? Fortunately, there are some situations where slab leak damage might be covered under your normal Dallas homeowners insurance policy. Standard homeowners insurance will usually cover the cost of taking out and replacing the slab so that the plumbing structure can be repaired — but most policies won't pay to repair or replace the Dallas plumbing system itself. If plumbing fails due to normal wear & tear, tree root problems, or any negligence on your behalf, you may have to pay for repairs out of your own pocket. Many times your Dallas home must have suffered damage from the slab leak for insurance to be used. For example, if you feel a warm spot on your floor when you walk into your bedroom, it's possible that a hot water pipeline has broken. If you pull back the carpet to find no damage, only a warm slab, many homeowners policies won't pay for Dallas slab leak inspection or repairs. It is best the to speak with an agent to see what you are and aren't covered for under your specific homeowners policy. Slab Leak Repair Materials & Labor Costs in Dallas? There are actually a few different pipe material options when repairing a slab leak in Dallas, Texas. If the intervention method is a spot repair, then copper is used. If a reroute is performed, then crosslinked polyethylene, commonly known as “PEX”, is usually used. This polymer based material is not only much cheaper than copper, but is far more durable than copper. Unlike copper, PEX is not susceptible to corrosion due to hard water, which is a very common cause of the slab leaks here in Dallas, Texas in the first place.